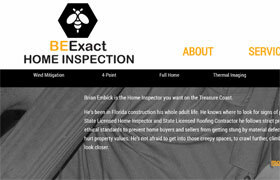 Brian Embick is a Hobe Sound home inspector that previously operated under the name Total Home Inspection. Brian wanted to rename, rebrand, and reinvent the company to be more memorable in a sea of home inspectors along the Treasure Coast of Florida. Our task was to create a new company name, logo, website, and supporting marketing material designed to capture our client’s high energy, experience, and attention to detail. The website has SEO baked-in on every page, e-commerce, email signup, and client-centric blogs and articles. The new brand inserts Brian’s initials into an evocative name reflective of our client’s high energy level (busy as a bee) and industriousness—and the website, brochure, business cards, and email marketing template are all branded with the same look and feel and tone. Naming conventions have shifted from what words mean (descriptive) to what words remind you of (evocative). This client’s previous company name, Total Home Inspections, used standard clip art of a house encircled by a swish, surround by palm trees. Very descriptive but not memorable. Our client’s industriousness reminded us of a busy bee with a reputation for fearlessness when walking on roofs or crawling under mobile homes. His initials just happened to be BE. BEExact reminds us how important it is to be exact during inspections in order to protect the lender, insurer, borrower and seller.